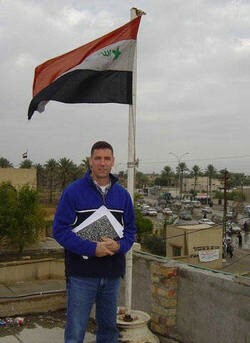 U.S. Marine Corps Lieutenant Colonel Robert J. Zangas, 44, of Level Green, Pennsylvania, was serving as a Department of the Army contractor with the Coalition Provisional Authority in Baghdad, Iraq, helping to restore radio and television communications. As he and three others were returning to base from a women’s center in Karbala when they were ambushed and killed. Born in Honolulu, Hawaii Robert Zangas graduated from the University of Colorado where he earned a degree in journalism. Following in his father’s footsteps, he was commissioned as a second lieutenant and earned his naval aviation wings in 1984. Lt. Col. Zangas served in Operation Desert Storm and Iraqi Freedom as a part of the First Marine Expeditionary Force. After returning from Iraq in 2003, he began working as a public affairs officer with the CPA. Lt. Col. Zangas was known as a gentle and affectionate man who always tried to spend quality time with his family. He left behind a wife and three children ages 10, 5, and 3. Their daughter is a Folds of Honor scholarship recipient.